Mr Ngige assured that despite the announcement by the National Assembly to proceed on recess until after the elections, the concerned committees in the National Assembly will continue work on the bill. 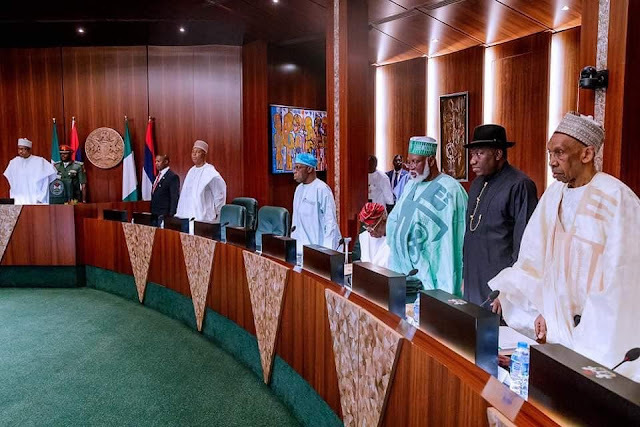 Tuesday’s meeting was attended by a former head of Nigeria’s Interim National Government, Ernest Shonekan; former Presidents Olusegun Obasanjo and Goodluck Jonathan and former military head of state, Abdulsalami Abubakar. Also in attendance were Vice President Yemi Osinbajo and the Senate President Bukola Saraki. Others are former Chief Justice of the Federation, Mohammed Uwais, State governors in attendance include those of Osun, Kebbi, Zamfara, Plateau, Ebonyi, Adamawa, Edo, Lagos, Niger, Borno, Ogun, Ekiti, Kogi as well as the deputy governors of Bauchi, Kaduna, and Rivers. Others present were the National Security Adviser, Babagana Monguno; Secretary to the Government of the Federation (SGF), Boss Mustapha; Head of Service of the Federation, Winifred Oyo-Ita; Minister of the Federal Capital Territory (FCT), Mohammed Bello; and Mr Ngige. It was earlier reported how the National Economic Council (NEC) has resolved to take the consultation on the new N30,000 minimum wage as demanded by the organised labour to the Council of State. This is even as governors have insisted that payment of the new minimum wage will not be possible without a review of the present revenue formula in the country.